Evergreen’s Nicole Brand goes for a kill Thursday at home versus Cardinal Stritch. The Vikings earned wins over Maumee and Cardinal Stritch last week to begin the season. Evergreen volleyball used a myriad of early aces to win the first set, then rifled attacks from all angles to beat Maumee 25-22, 25-14, 19-25 and 25-16, giving a victory to Nichole Thanasiu in her first match as the Vikes head coach last Tuesday. Kennedi Keifer’s back-to-back aces helped the Vikings rebound from an early 4-2 deficit to a 6-4 lead before a pair of Evergreen attack errors allowed the Panthers to draw even. A quick 5-0 burst led by McKenna Babcock’s pair of aces and Kelsie Komisarek’s cross net push gave the Vikes an 11-6 lead but Maumee clawed back to catch the Vikings even at 18 on Nicole Archambeau’s pair of left-side kills. Nicole Brand’s redirect from the middle gave Evergreen a slim lead but a net violation again drew the Panthers even. However, a Maumee service error and consecutive blocks by Komisarek and Kori Kreuz gave the Vikings a 22-19 lead and closed the set on Komisarek’s tip from the left side. Maumee held an early 4-3 lead in set two but Brand ignited an 8-0 blast with a cross court tip and a slam dunk block at the net to move the Vikings ahead 7-4. Komisarek added another tip, then a shot from the left along with another Babcock ace, gave Evergreen an 11-4 lead. The Vikes continued to expand the lead on aces from Claire Conrad and Zoe VanOstrand before Babcock got rolling from the left side with three more booming kills to help put away the second set. Evergreen had a hiccup in the third set, allowing Maumee to score 8 of their first 11 points on hitting errors and fall behind by eight points, 11-3. Conrad’s block, a push on a second ball and score off a save closed the gap to 14-10. After Conrad’s salvo, however, Maumee’s Jessica Perrault answered with a trio of shots of her own to regain a 20-12 lead. Savanna VanOstrand countered with a block and a dunk but a couple of Viking service errors helped the Panthers keep control to win the third set. It was VanOstrand and VanOstrand, Zoe with an ace and Savanna with a slam off an overpass to give Evergreen a quick 2-0 lead in the fourth, but again Maumee battled to tie at 6-6 behind two kills from Jamyson Butler. That’s when Cece Silvestri saved a pair of Maumee kill attempts on the same volley before Conrad scored on a second ball push to give the Vikings a lead. Komisarek scored on a cross net push and Silvestri nailed consecutive aces to expand Evergreen’s lead to 11-6. Zoe VanOstrand added two aces and Babcock put the exclamation point on the match with a cannon shot of a kill from the left side. 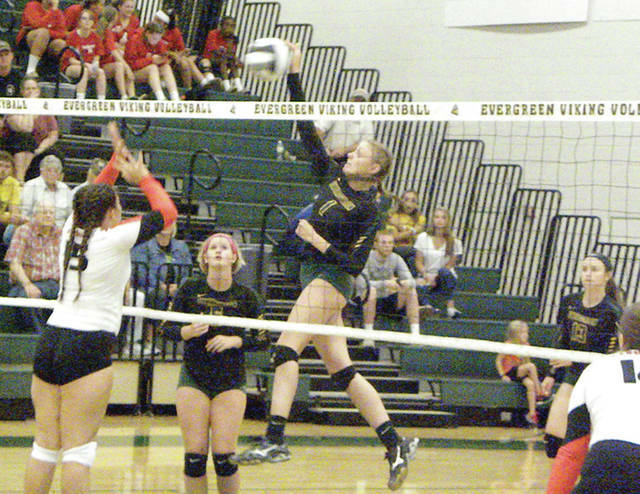 Evergreen used the same recipe of a heaping helping of service aces along with a dash of offensive attacks from a number of sources to bake up a huge sweep over Cardinal Stritch, 25-14, 25-18, 25-14 to move to 2-0 on the young season Thursday. Zoe VanOstrand nailed four aces during an opening 9-0 Viking run that made the Cardinals chase them from the get-go in the first set. Stritch got as close as 14-8 behind the attacks of senior Kaylie Arnold who recorded five kills during that time. However, the Vikings answered with another run, this one of six straight points to put the first set away. Kelsie Komisarek’s shot down the side line, Savannah VanOstrand’s kill from the right, and a couple kills from Kori Kreuz – the second a booming slam from the middle – keyed the run. The Vikes got out to an early lead in the second set with a Kreuz tip, then a trifecta of aces to put Evergreen up 5-1. Then it was Myra Kuszmaul scoring again and again, in fact five consecutive Viking points from the middle to boost that lead to 13-6. A double block from Kreuz and Claire Conrad got it to 15-6 before Stritch rallied on Miranda Nino’s ace and a couple of Viking shots that went awry to close to 15-10. But with Mikayla Heintschel serving, the Vikes regained control, getting two blocks and a stuff from Kreuz to again go up at 20-12. Kennedi Keifer’s dump off the set and Conrad’s shot that painted the back line closed out the second set. McKenna Babcock’s three early kills in the third set helped put Evergreen up 7-3, before Nicole Brand nailed a shot cross court to put the Vikes up five. Komisarek’s four points including a cross net tip doubled up the Cardinals, 16-8. Then for the second time in the match, Kreuz nailed three straight aces to carry the Vikings home to a third set win. The Vikings now host Swanton tonight.